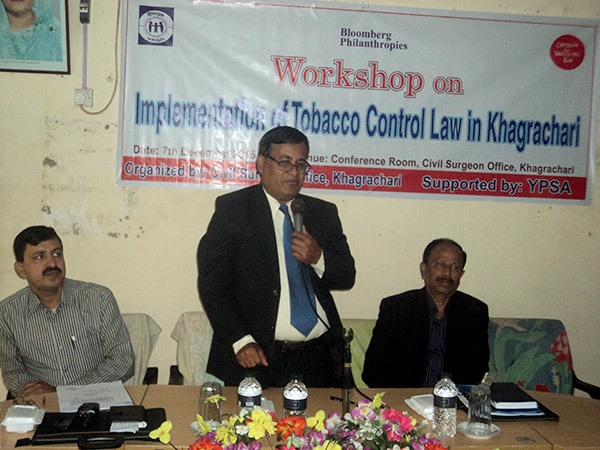 YPSA and Civil surgeon Office of Khagrachari district jointly organized a workshop on Implementation of Tobacco Control Law in Khagrachari with the assistance of Campaign for Tobacco Free Kids and Bloomberg Philanthropies on 7th December 2015 at Conference room, Civil Surgeon Office of Khagrachari. Dr. Nishith Nandi Majumder, Civil Surgeon of Khagrachari district was present as guest speaker of the workshop. Local administration, taskforce, authorized officer and law enforcing bodies are the key actors to enforce the Tobacco Control Law and Rules and YPSA’s aim to ensure the direct enforcement of TC Law and Rules in project working areas through this key actor. So the district taskforce members, authorized Officer, representatives from Khagrachari municipality were the participants of the workshop. The main objectives of the workshop were to share Tobacco control law and rules, role and responsibility of authorized officer/magistrate/taskforce and develop action plans for implementing TC law. Ms. Nasim Banu, Team Leader of Smoke Free Project of YPSA has facilitated the workshop and shared he information on harms of tobacco use, global and country status, government initiatives, overview of the amendment TC law and rules, violation of laws, TC law compliance findings, role of authorized officer, taskforce and magistrate. At the end of the workshop each participant has shared their next initiative to implement the TC law at their jurisdiction. The participants agreed that Tobacco control should address by all sectors as an important issue. It needs to have a strong implementation and reporting mechanism and government should take lead on it. They also emphasized to take awareness building initiatives for reducing the tobacco use and production in Bangladesh.